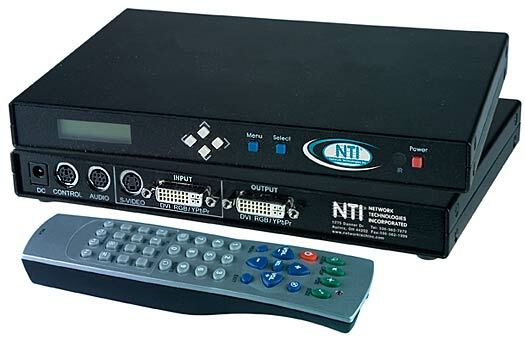 Network Technologies Inc manufactures keyboard-video-mouse (KVM) and audio/video switches, splitters and extenders for computers (PC, MAC, and SUN, including USB) and video sources (DVD player, satellite receiver). By consistently providing KVM and audio/video solutions that combine innovation with reliable high-performance, they empower their customers to improve efficiency, reduce equipment and energy costs, and maximize space utilization. They have been rewarded with over 20 consecutive years of dramatic growth. NTI's products are hardware-based solutions that are easy to use and world-renowned for their crisp and clear 1900x1200 video resolution. Installation of their products does not require special tools or the installation of additional software on your computer. The DVI to VGA Converter changes your computer's digital DVI signal to analog VGA video. The converter generates all the compatible digital to analog conversion signals to make the connection between the DVI-D input and the VGA output work. 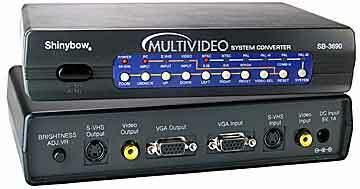 The SPLITMUX Quad Screen Splitter allows you to simultaneously display and monitor video signals (digital DVI or analog VGA) from four different computers and/or video sources on a single analog or digital screen. 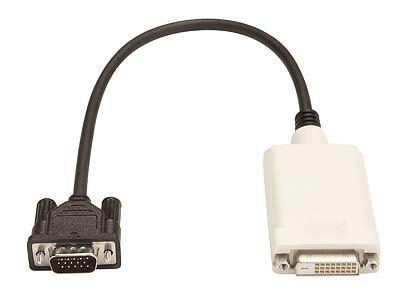 The VGA to DVI Converter changes your computer's analog VGA signal to digital DVI video. The converter generates the compatible analog to digital conversion signals to make the connection between the VGA input and the DVI-D output work. 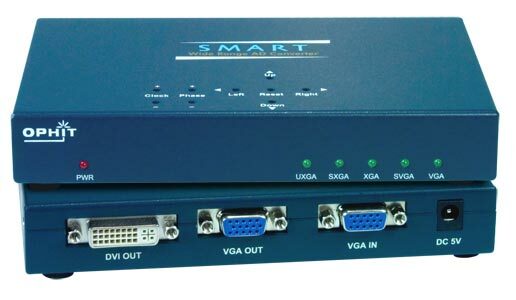 The VEEMUX SM-nXm-AV-LCD Audio/Video Matrix Switch is designed to simplify the task of routing audio and video input from many computers to multiple displays (projectors, monitors, etc.) and speakers. 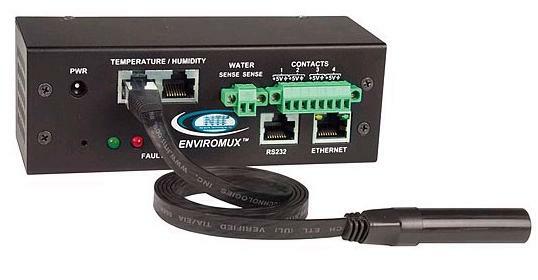 The VEEMUX CAT5 Audio/Video Matrix Switcher works with NTI's CAT5 transmitters and receivers to create a high performance audio/video signal routing system with a maximum extension of 600 feet. 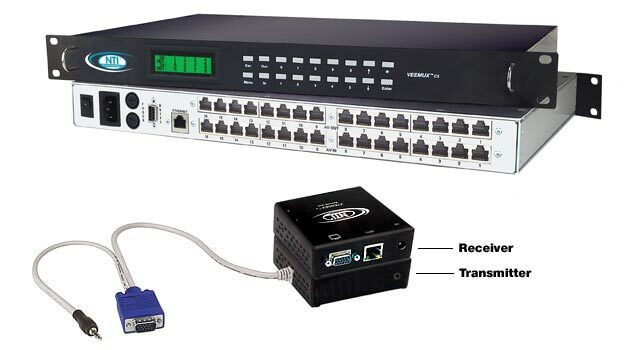 The VEEMUX SM-8X4-HDA is a versatile multi-input A/V matrix switch that independently switches eight sets of YPbPr component video and analog/digital audio signals to any or all of the four outputs. The VEEMUX SM-nXm-15V-LCD Video Matrix Switch is designed to simplify the task of routing video inputs from many computers to multiple displays (projectors, monitors, etc.). Control up to sixteen single link DVI-enabled USB computers Also known as: rackmount kvm drawer with USB DVI KVM Switch, rack mount keyboard drawer, console drawer, keyboard monitor drawer, KVM drawers, keyboard LCD drawer, rackmount keyboard drawer.